Professional-only Color Care Acidic Milk Rinse with coconut and oat milks, provides an extra caring step after color service, noticeably softening, smoothing, and rebalancing hair’s pH for 5X more vibrancy and 6X smoother hair. 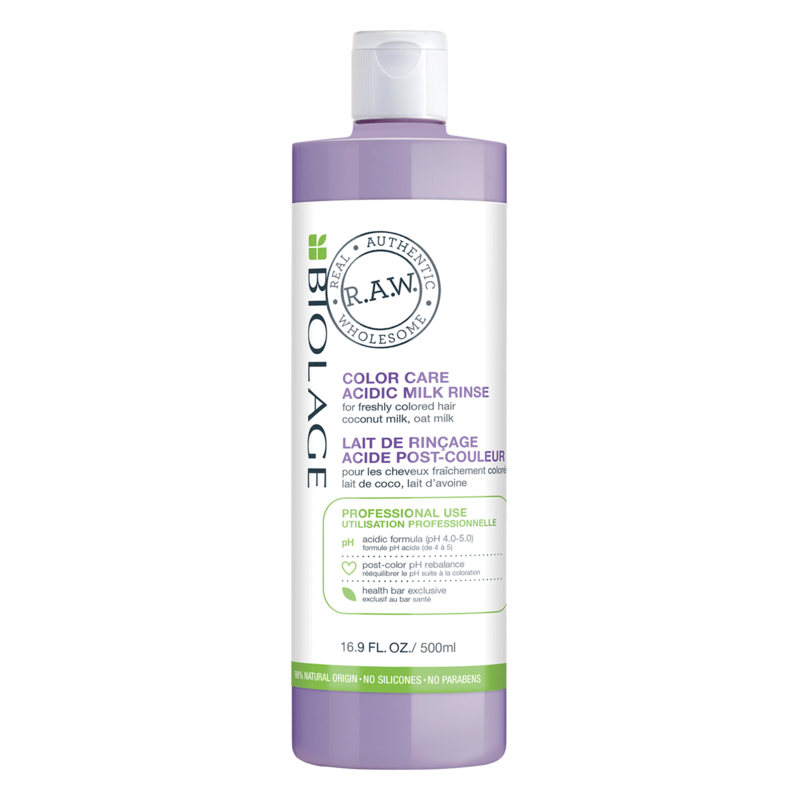 * This liquid rinse cocoons and saturates strands, transforming the look and feel of hair after color service. Visually seals for optimal color vibancy. *when used as a system vs. unwashed hair. After color service, rinse color from hair. Apply shampoo. Rinse. Towel blot hair to remove excess moisture. Directly apply Acidic Milk Rinse from roots to ends. Leave in 5 minutes. Rinse. Follow with conditioner. In case of contact with eyes, rinse them immediately. *We consider an ingredient to be of natural origin if it is unchanged from its natural state or has undergone processing yet still retains greater than 50% of its molecular structure from the original plant or mineral source. 129759 MX17-INGREDIENTS: AQUA / WATER / EAU, CETEARYL ALCOHOL, BRASSICAMIDOPROPYL DIMETHYLAMINE, COCOS NUCIFERA OIL / COCONUT OIL, PARFUM / FRAGRANCE, OCTYLDODECANOL, TARTARIC ACID, CAPRYLYL GLYCOL, SALICYLIC ACID, GLYCERYL STEARATE, TOCOPHEROL, GLYCERIN, LINALOOL, GERANIOL, GLYCINE SOJA OIL / SOYBEAN OIL, AVENA SATIVA KERNEL EXTRACT / OAT KERNEL EXTRACT, COCOS NUCIFERA FRUIT EXTRACT / COCONUT FRUIT EXTRACT, XANTHAN GUM, CITRIC ACID, SODIUM BENZOATE, POTASSIUM SORBATE (F.I.L. D213833/1). US Pat. Pending..